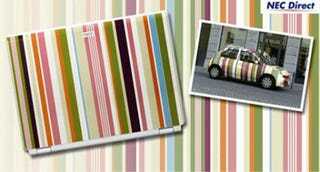 If you live in Japan and drive a stripy Nissan Micra (March), we are so sorry. Still, if you desperately want an NEC Nissan branded laptop to match said vehicle, you are in luck. NEC has just announced an equally grotesque laptop, finished with enough stripes to create an accomplished rock band.